Kostunica said that recent outbreaks of violence were a warning that the situation in the province had not improved since the November elections when Belgrade agreed to urge Serbs to vote in return for guarantees from the UN mission. "Kosovo Albanians must decide if they envisage a serious change of policy towards peace and stabilisation... or whether they intend to continue living within a context of violence," said the president. 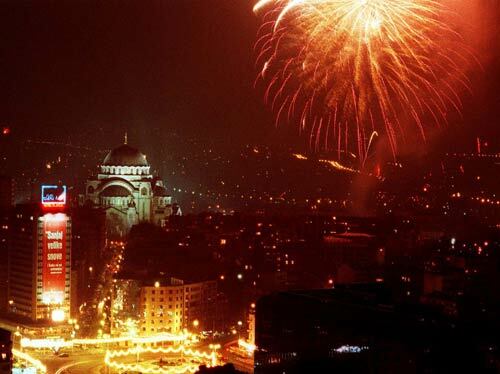 This year's Christmas in Kosovo and Metohija was celebrated by Orthodox Serbs with spritual joy despite the restricted freedom and security threats. 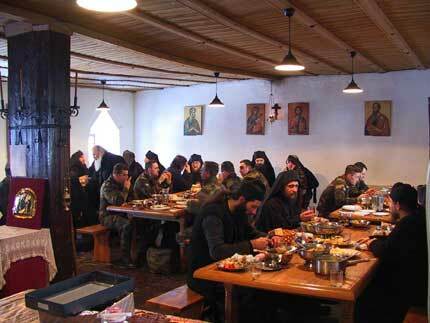 Those Serbs who managed to reach their churches attended the services under the KFOR military protection. Many believers had to travel in armoured vehicles to their parish churches, especially in Pristina (photo 2). Just before the Christmas day Dragoljub Markovic, a Serb from Kosovska Kamenica, was killed in a bomb attack. Two more bomb attacks occured in other parts of the province in which, thank God, no one was injured. These "Christmas gifts" from Albanian extremists reminded the Serb population that they are the only Christians in Europe who spend the Christmas holidays under the threat of terrorist attacks in which children, elderly and Christian churches are targeted in a Moslem dominated Kosovo province. 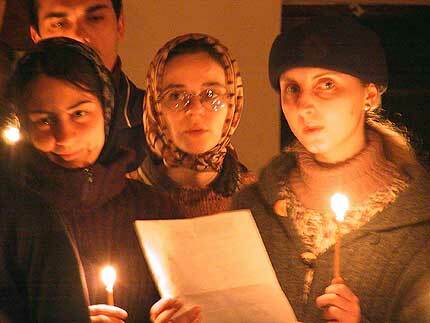 Pilgrims in Decani Monastery during the Christmas Liturgy - Christ is born! 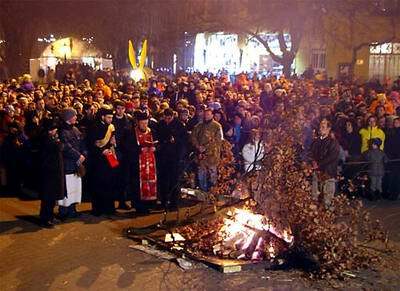 Serbia celebrated the Christmas in festive atmosphere. 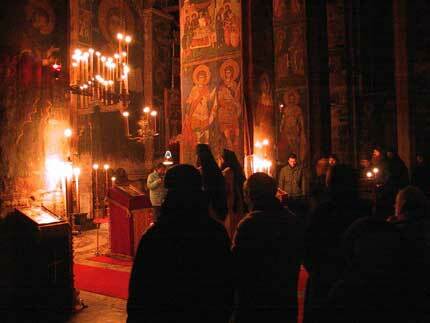 The most joyful moment was the beginning of the central midnight Christmas liturgy in the huge Cathedral of St. Savas. 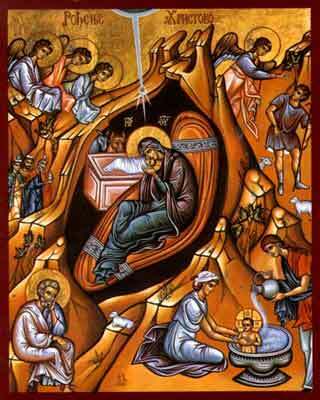 Dozens of bells which were installed a week ago sounded with festive chimes the melody of St. Savas hymn. His Holiness the Patriarch served the liturgy with concelebration of bishops and priests. The service was attended by thousands of Orthodox believers including the Crown Prince Alexander with his family and the highest state dignitaries. 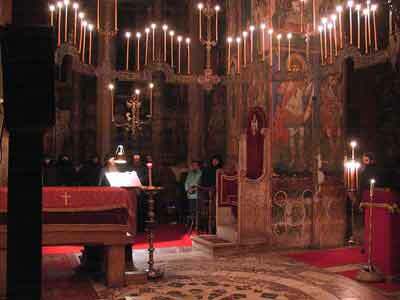 Christmas was celebrated in all diocesan cathedrals and parish churches all over Serbia and Montenegro with prayers for peace and better future in the Balkans which is still recovering from years of war and suffering. 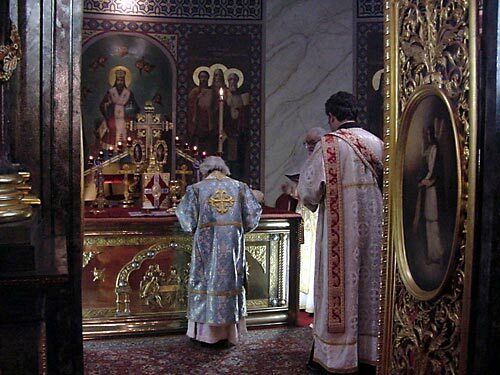 Special prayers were read for the suffering Orthodox Christians in Kosovo and Metohija where Orthodox Christians live through the most difficult times in their recent history. 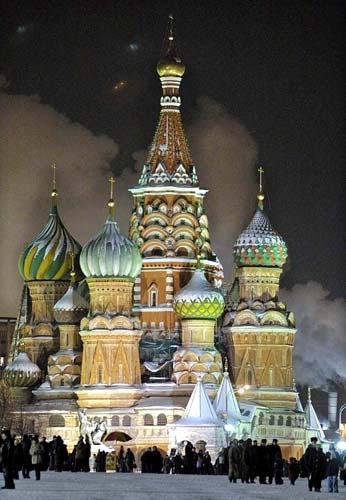 Photo1: St. Sava's cathedral at midnight 24/25 Dec (Old Calendar), 6/7 January (New Calendar) - hundreds of thousands were lit around the church built on the site where Sinan Pasha burned the relics of the First Serb Archbishop - St. Sava - in 17th century. Photo3: Novi Sad in festive lights - the city which lost its bridges in NATO bombing is boosting with new spirit of democracy. Photo5: HRH Crown Prince Alexander and Princess Catharina with children's toys which they brought from Athens for the poor children in Serbia.